A series of musical concerts known as the Night Serenades that offer a variety of musical pieces to the audience is taking place in Batumi. The festival will move to Tbilisi in September. Giorgi Isakadze, Liana Isakadze’s nephew, is the artistic director of the festival with Liana. He also is the founder and director of a music school in Ingolstadt, Germany, as well as dance and music academy in Munich. “This year, our program features romantic part as well. Violinist Geza H. Legocky will join us on August 28. We will present tango Evening on August 29. We are continuing our festival in Tbilisi where the concert will take place at Tbilisi State Conservatoire,” said Issakadze. He mentioned that the program was elaborated and established together with Liana Isakadze and that collaborating with her is a unique experience because she is always searching for new ways of development and creativity. Gia Jashvili is a violinist, who has been performing in Europe, Asia, America, and Australia for more than 20 years will be playing throughout the festival as well. He has worked with world-famous musicians such as Yo-Yo Ma, Joshua Bell, Lorin Maazel, etc. He began his studies with his mother Nana Jashvili who is a well-known violin virtuoso and professor at the Music University in Essen (Germany). His family moved to Europe for him to pursue his musical development when he was 10. 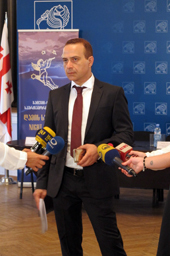 Jashvili noted that he along with other organizers suggested the musicians for this year’s festival. He also mentioned that on September 2, the audience would have a chance to hear Opera-Fantasy, famous arias arranged for violin and strings. Jashvili is the author of this project. “The festival started on August 26 and performance dedicated to the 70th anniversary of the composer, Ioseb Bardanashvili took place. Violinist Geza Hosszu-Legocky will perform many challenging and famous pieces on August 28 in Batumi. Alexander Korsantia together with Nikoloz Gvritishvili will perform during the last concert,” said Jashvili. Bardanashvili won Israeli Prime Minister Prize twice, Israeli Theatrical Oscar and other prestigious awards. He teaches at the Tel Aviv and Jerusalem Music Academies. The festival – Night Serenades – congratulated the composer on his anniversary and offered the audience his “Serenade” for violin and chamber orchestra, which he composed in 1983 for Liana Isakadze.